Geiranger is a tiny little village, situated at the end of the UNESCO World Heritage-protected Geirangerfjord. The real draw is the fjord itself, with its green mountainsides, snowcapped peaks and fairytale-esque waterfalls. You'll get up close views of the fjord -- and the famous Seven Sisters and the Suitor waterfalls -- as you sail in and out of Geiranger; in summer, it'll be light out for both the early morning arrival and afternoon or early evening departure. The scenic cruising will be the highlight of a Norwegian fjords itinerary. 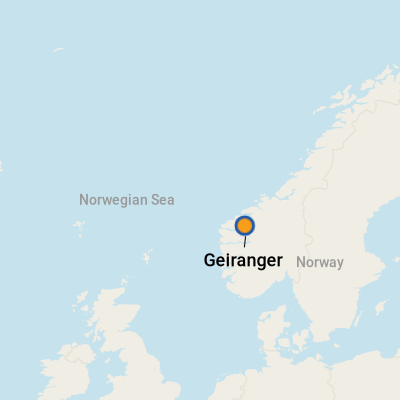 The town of Geiranger can be traversed from end to end in about five minutes. 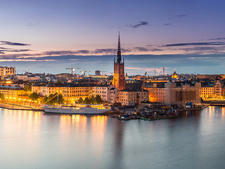 It's got the requisite souvenir shops, restaurants serving up reindeer and caramel-tasting brown goat cheese, a charming old church and the Fjordcenter to get your fjord 411. But mostly it serves as a jumping-off point for tours in the area. For a bird's-eye view of the fjord scenery, head up to scenic viewpoints like Dalsnibba or Eagle's Bend or take to the skies in a helicopter. Or go the other direction, and hop in a kayak to get closer to nature and feel the enormity of the mountains above you. For a bit of history and culture, visit a mountain farm and learn about how people live in this remote area. 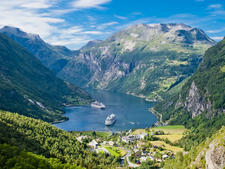 About 150 to 200 cruise ships visit Geiranger every year, bringing more than 700,000 tourists during the May-through-September tourist season. With up to five ships in port at a time -- you wouldn't think the harbor could fit that many -- tours book up and the streets in town get packed. If you've got your heart set on a specific tour, do your research and consider booking in advance. Geiranger is such a beautiful place, it would be a shame not to see it to its fullest. Ships tender to the Geirangerfjord Cruise Terminal, three short piers side by side. Amazingly, given the tiny size of the town, a maximum of five ships can call in Geiranger in one day, with a limit of 8,000 cruise visitors. Nothing in Geiranger is too far away. The area immediately adjacent to the pier offers a tourist office (where you can book day-of tours), toilets, a post office, souvenir shops, bus pickup, taxi stand and food. Norway is very expensive. Be prepared for sticker shock if you're planning on dining in town or doing any shopping. Also, the weather in Norway can be changeable, though bad weather can linger for hours before clearing up. Wear layers and bring rain gear -- even if it seems nice when you're preparing to debark. If you're booking any kind of tour in advance, make sure you're willing to go even if the weather is overcast or wet. On our day in Geiranger, many people reported the scenic overlooks to be fogged in with no view to be had. On Foot: Geiranger proper is about a five-minute walk end to end. If you want to reach the church, Fjordcenter, Hotel Union or hiking trailhead, it's a steep 10- to 15-minute walk up Geiranger's one real road. By Bus: A City Sightseeing bus takes independent travelers to Geiranger's two scenic viewpoints, Flydalsjuvet and Ornevegen (Eagle's Bend). The tour takes 90 minutes, and unlike the company's omnipresent hop on hop off buses, the Geiranger version does not let passengers come and go as they please (though there's a 20-minute stop at each overlook). By Taxi: Taxis are available on the main road by the pier if you wish to head up to Westeras Farm or another destination. They take both cash and credit cards. Currency is the Norwegian krone (NOK). 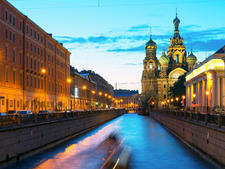 Check www.xe.com and www.oanda.com for current exchange rates. An ATM is located at the supermarket, and you can exchange currency at the Fjordbuda souvenir shop. Norwegian is a varied language, with two written forms --Nynorsk and Bokmal. When speaking, Norwegians use their own regional dialects but generally can understand each other. Most people speak excellent English, as kids learn it in school from an early age. A few key phrases to know include: hallo (hello); tak (thank you); ja (yes); and nei (no). Norwegian fare centers around fish and local meat, as well as berries from the area such as cloudberries, strawberries, raspberries and lingonberries. Fish is often served cold -- think gravlax (salt-cured salmon) or lutefisk (fish steeped in lye) -- or as fish soup; meats might be reindeer, elk or even whale. A yummy, and affordable, treat is a Norwegian waffle served with jam and sour cream, or even the caramel-flavored brown goat's cheese. You can find cafes and food stands in Geiranger's shopping area, or head to the hotels for a more formal repast. If you make the climb to the Fjordcenter, consider stopping at the Hotel Union for coffee or drinks with a view.